Adults have to share their lives and living space with other people; family, friends, spouses or spouse equivalents, children, roommates. Unfortunately, even people you love can be a pain, (especially when you share a bathroom). So where do kids learn to deal with people they love but who drive them crazy? You need look no further than their annoying, beloved brother or sister. 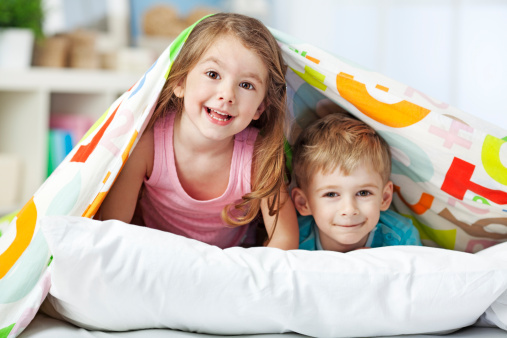 Sibling relationships provide your child with their first lessons about how to handle the more difficult aspects of long term, intimate relationships. Here are some ideas about how to help your kid get the most out of a few of the more important things siblings learn about sharing your life with someone. Kids don’t get to choose their siblings (kind of like you don’t get to choose your coworkers) but they still have to work together. You can help your kids practice team work by assigning them tasks to complete together (even though it would be less trouble to just keep them in separate rooms). If they argue or complain just add more tasks. You might be able to get the whole house cleaned in one weekend AND teach them an important skill! More than anything else, sibling relationships require kids to learn how to settle an argument. However, it is usually not a good idea to leave them to their own devices. Kids (and humans in general) have a tendency to devolve into the worst forms of social organization (e.g., dictatorships, rebellion, anarchy). Sitting them down and teach them the steps of effective problem solving. Then make them use what they learned. There will be no shortage of opportunities to practice; and they’ll need it. Playing together requires brothers and sisters to learn about leadership as well as how to follow another’s lead. Consider taking some time to actually require each sibling to be the boss of a task. Help them learn the difference between leading and bossing. They will also need help learning to be a good follower (which doesn’t mean just going along with someone). Kids always end up wanting something that belongs to their sibling. To be successful they either have to be naturally generous or they have to learn how to negotiate. Most kids think negotiating is either being demanding (“Let me use it. I let you borrow my Ipod last week!”) or begging (“Oh, come ON. Please! Don’t be so stingy.”). They can benefit from direct instruction about how to negotiation effectively (and how to be a gracious negotiation participant). Learning how to relate to others in loving, supportive and healthy ways takes practice; lots of practice. Happily, sibling relationships provide the perfect practice field. With a little coaching siblings can end up learning a lot about relationships while also forming a lifelong friendship.